The Recruitment Ninja Framework has four main belts being Yellow, Green, Blue and Black. Each Belt contains "layered" learning modules that together build a foundation of knowledge that we use to turn you into a Recruitment Ninja. There is one other level within the Recruitment Ninja which we call Sensei. Sensei acts as a path to leadership/Management in recruitment and has been specifically built for those who are (or getting ready to) taking on a Leadership role in either Recruitment Agency or Internal Recruitment function. The only way you can access Sensei is via Black Belt as many of the lessons in Black Belt are a prerequisite lesson for those in Sensei. Recruitment Ninja belts have a series of lessons that need to be completed. Recruitment Ninja Workbooks - All lessons within Recruitment Ninja come with a Workbook that needs to be downloaded before the start of the lesson. The Recruitment Ninja workbooks come complete with plenty of space for writing notes. We suggest that students scribble relentlessly during lessons as this improves their retention rate. Supplementary Information - In some cases the Recruitment School lessons will have supplementary information such as a information from a supplier eg Google. Students are encouraged to download/use supplementary information to aid their learning. Training Videos - all Recruitment Ninja lessons come with a training video that is embedded into the lesson. These videos are the core element of the Recruitment School Platform. Recruitment School Training Videos are 15-40 minutes long so a student can easily complete lessons during their lunch or after work without impeding their normal duties. Quiz - all Recruitment Ninja lessons come with a quiz. The quizzes consist of five questions, some of which are multiple choice and some that are essay's. The student requires 100% to pass the lesson and has two chances to complete the question. Should they fail, they are required to re-sit the lesson before they are able to attempt the quiz again. Who should use Recruitment Ninja? Upon completion, what does a student receive? 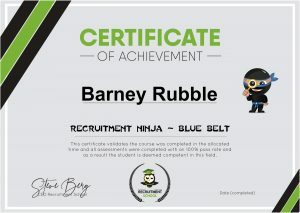 Upon the successful completion of the appropriate number of modules in the Recruitment Ninja Belt, students will receive a certificate of attainment similar to the certificate shown here. 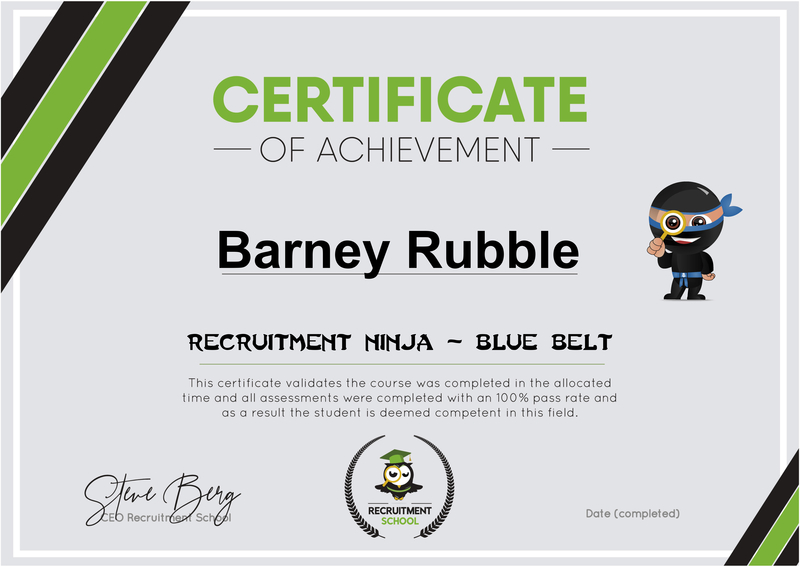 The certificate proves that the student has completed the course and has been granted the status of Recruitment Ninja - ? Belt. Is there other support available for Students? At Recruitment School, we have tried to make the learning process as through as possible. All of our lessons are extremely comprehensive so most students will be able to gain a lot of information from your lessons. To complement the lesson content we do provide chat support and webinar support. The chat support is free and can be found by clicking the chat box on the bottom right hand side of your screen. As added support, Webinars are run monthly and are group webinars for students working through their respective Belt. The attraction of the group webinar is students are able to learn from others who have different experiences. Group webinars for attract a fee and run between 1-1.5 hours. These can be purchased by visiting our Live Webinars section or clicking here. Attendees will be requested to register after payment has been accepted. Once registration is complete the attendee will receive a a unique code to enter the webinar. If you would like a dedicated webinar for your team, please complete the enquiry form below explaining what you have in mind and we will be in touch within five working days.